Most boiler waterside and fireside gaskets are replaced yearly during the annual teardown and boiler inspection. The D. B. Johnsen Company offers gaskets for all makes and models of boilers, including Cleaver-Brooks®, Hurst, Kewanee, Burnham, Johnston, North American, Superior, York Shipley, Sellers, Patterson-Kelley, and more. The most commonly used waterside gaskets are a rubber type manufactured by Topog-E. These are very durable, fit well, and have become the industry standard. Topog-E also produces many other gaskets, some of which are used on McDonnell & Miller castings and on gauge glass sets. Imitation gaskets are available in the marketplace, but they rarely fit as well, or last as long, as the Topog-E. Our Parts Department has the knowledge and experience to assist you in selecting the proper Topog-E gasket for your boiler application. Visit our Topog-E Gasket Page. To request more information or to order Topog-E gaskets, please do not hesitate to call the D.B. Johnsen Parts Department at 1 800-442-1242 or click here to email us. Fireside gaskets usually differ by manufacturer and are comprised of many different kinds of gaskets. Often times, these are proprietary in nature and are expensive. However, based on our years of maintenance experience and working with gasket producers from all over the country, the D. B. Johnsen Parts Department has found affordable gasket solutions for nearly all types of boilers. Most fireside gaskets, regardless of manufacturer, can be classified as tadpole gaskets (as found on many Cleaver-Brooks® boilers), segmented gaskets, high temperature braided fiberglass rope, or ceramic fiber rope (often called kaowool). Many times these are proprietary and when purchased from the OEM, they are very expensive. However, we have found reliable and affordable gasket solutions for all types of boilers. We stock fireside gaskets and gasket materials for nearly every boiler manufacturer and will work with you to customize a solution for your obsolete or unique applications. Just contact our Parts Department at 1 800 442-1242 or click here to email us. The D. B. Johnsen Company offers pre-assembled gasket kits to match individual boiler manufacturer's requirements. Each gasket kit contains all the necessary gaskets and materials including rivets and fasteners. We also will include at customer request, adhesives and glues for stabilizing rope and fiber strips to ease in their installation. 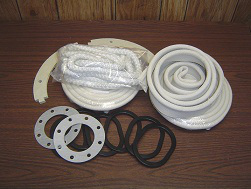 Our most popular pre-assembled waterside gasket kit is the one designed for Cleaver-Brooks boilers*. We have been providing these kits for many years at competitive pricing with great customer satisfaction in terms of durability, ease of installation, and value. Click here to learn more about our Cleaver-Brooks® gaskets and gasket kits*. To begin saving time and money with gaskets and gasket kits from the D. B. Johnsen Company, call our Parts Department at 1 800-442-1242 or click here to email us. Our knowledgeable staff will help you select the appropriate gaskets for your application, just have the manufacturer and model number available when you contact us. *Although our gasket and gasket kits are made for and fit Cleaver-Brooks® boilers, to reduce customer cost they do not carry the Cleaver-Brooks® endorsement. For customer convenience we have maintained the use of part numbers resembling the standard Cleaver-Brooks® part numbers. Cleaver-Brooks is a registered trademark of Cleaver-Brooks, Inc. The D.B. Johnsen Company is not a factory authorized representative of Cleaver-Brooks.